Students need many opportunities to informally experience the outcomes of tossing one die and then two dice. Students should play games, gather data, collate class data and analyze those results to develop a conceptual understanding of the probability of different outcomes. See Data Analysis: One-Die Toss Activities for more information and activities on the probability of the outcomes of tossing one die. See Data Analysis: Two-Dice Toss Activities for more information and activities on the probability of the outcomes of tossing two dice. 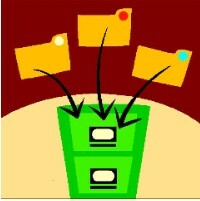 The activities found on these Mathwire.com webpages support students as they answer questions about the world around them. Learning to organize and analyze data are important life skills that students will use in both their professional and personal lives. See pictures of Student Halloween Glyphs. See pictures of Student Turkey Glyphs. 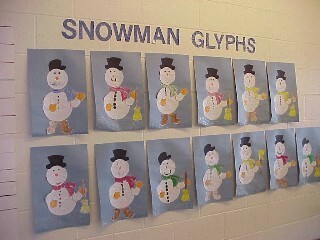 See pictures of Student Winter Glyphs. Data Analysis Investigations encourage students to collect real, meaningful data, organize that data and analyze the data to draw conclusions and explain what they have learned. These investigations encourage students to apply mathematical analysis to real-life data and/or applications in order to investigate problems or issues. See Data Analysis 2 for more suggested data collection activities. See Data Analysis: Two-Dice Toss Activities for activities that develop student understanding of the probability of tossing two dice. 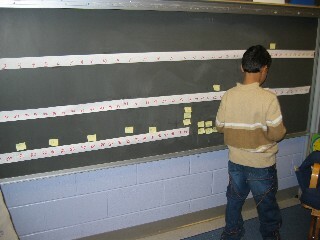 This page includes many games that help students collect and analyze data. See Data Analysis: One-Die Toss Activities for activities that develop student understanding of the probability of tossing one-die. This page includes many one-die games that help students collect and analyze data. See Coin Flipping Activities for activities that develop student understanding of the probability of coin toss events. See Winter Data Collection for seasonal data collection and graphing ideas. Sampling Activities include background on this important statistical technique and the Cereal Toy Investigation that encourages students to use a simulation to analyze how many boxes of cereal they would have to buy to get all six different toys in a cereal toy promotion. 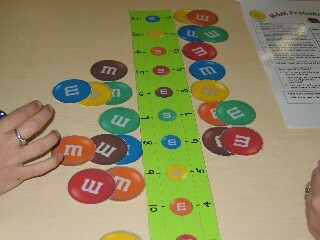 A Cereal Toy java applet is included so that students can collect data quickly to increase the sample size and compare the results to their initial small sample. Online lesson plan for Will There Be a White Christmas This Year? encourages students to use statistical data to investigate weather patterns across the USA and construct a contour map of the probability of snow cover on Christmas Day. See more Data Analysis & Probability Math Templates: insert in sheet protectors for student use with dry erase markers or for teacher use as overhead transparencies. See Problem Solving Resources for open-ended assessments that involve data analysis and probability. See all Data Analysis & Probability Games. See Literature Connections for data analysis and probability. See more Data Analysis & Probability Links. See all Enrichment Activities for data analysis and probability.